It’s a common complaint among gardeners – there’s never quite enough room to grow everything you’d like. It’s a predicament that’s especially true in small city gardens, where space really is in scarce supply. So what to do about it? How can you cram more vegetables, herbs and fruits into even the tiniest of spaces? When every last nook and cranny counts, choosing what to grow takes on a whole new importance. In tiny gardens there’s little sense in growing slow or space-hungry vegetables like Brussels sprouts or parsnip. Opt for quick growers like lettuce, radish or beets instead, or go for vegetables such as chard or zucchini that offer high yields or repeat harvests. Herbs are high value crops that go a long way in the kitchen. And don’t miss out on fruits too. Cordon or step-over forms of apple and pear, cane fruits such as raspberry and, of course, compact strawberries are a few wise choices for space-strapped gardeners. Traditional long rows of vegetables aren’t particularly space-efficient. Using narrow beds on the other hand makes it easier to grow in blocks, with plants spaced equidistantly. This helps crowd out weeds as well as making best use of the space. It also helps to concentrate resources where they are needed, avoids the risk of compacting the soil by stepping on it, and makes tending to crops easier. Square foot gardening – where crops are grown at reduced spacings in square-foot blocks – takes raised bed growing one step further. By using deep raised beds and a soil mix designed for optimal root growth, crops may be grown even closer. Containers offer instant impact, flexibility and convenience. They’re the go-to choice on patios and balconies, and are easily moved to make the most of sunlight or to protect plants from harsh weather. Be opportunistic about where you put your pots – any flat surface is fair game! Smaller containers are good for compact crops like salad leaves and annual herbs, while vegetables with bigger root systems such as tomatoes need suitably larger pots. Check that containers have adequate drainage. If necessary punch or drill extra holes into the base so there’s at least one drainage hole every three inches (8cm). Stand containers on pot feet or blocks to further improve drainage and airflow for healthier plants. Make sure to keep plants in pots well watered and fed. Whatever the size of your garden, there’s always plenty of vertical space! Train vining or sprawling crops such as beans, peas, cucumber and squashes up and over trellising, canes and other supports. Use their rambunctious habit to create a soothing green backdrop to your tiny oasis of calm. Wall-mounted planting pockets and tubes like the ones above will really pack in the pickings, while fence-hugging pots and hanging baskets bring bursts of color and an opportunity to graze on the likes of cherry tomatoes or juicy strawberries. When you’re cramming more in than is normally recommended it’s essential to feed plants properly. Organic fertilizers such as chicken manure pellets are preferable to artificial fertilizers, which increase the risk of a harmful build-up of salts around the roots. 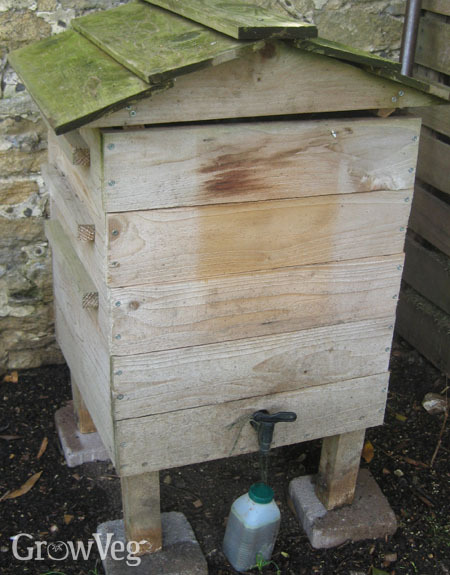 If you don’t have space for a traditional compost bin consider a worm bin or ‘wormery’ instead. It’s more compact and the hundreds of worms within it do an efficient job of turning kitchen scraps into growth-boosting worm compost and a nutrient-dense liquid feed. Plan ahead to have young plants ready to replace crops as they’re harvested or spent. You don’t need a greenhouse for this – a simple cold frame will do. And you’d be surprised just how much you can start off on a sunny windowsill. Plug trays are convenient because you can sow straight into them then grow the seedlings on right up to the point of planting them. Don’t let the size of your garden compromise your quest for a cornucopia of crops. Big ambitions can grow from tiny spaces, and I hope this video has given you a few ideas to get started. As always we’d love to hear from you too, so if you have any tips on cramming more into a postage stamp plot I’d invite you to share them below. "What are the white pipes that have lettuce growing in them or where can they be puchased? " "Hi Martha. I'm not sure where that picture was taken or where you can source them from. You can get similar tube planters, for example, search 'Polanter planter'."